This spring has tested the hardiness of my hardy soul. I bet it’s tested yours, too, especially if you live in the Northern Plains and parts east that were bombarded by “Winter Storm Xanto”. In light of what my fellow cold climate gardeners are enduring, I’m not going to complain about my weather, which seems like it’s finally done with snow accumulation, even if it can’t string two mild days together. Yes, Spring has been slow to arrive, but it is arriving, one treasured flower at a time. A slow spring highlights the need to have as many early flowers as possible. Remember: take pictures of where the snow melts first, and plant your earliest-blooming flowers there. 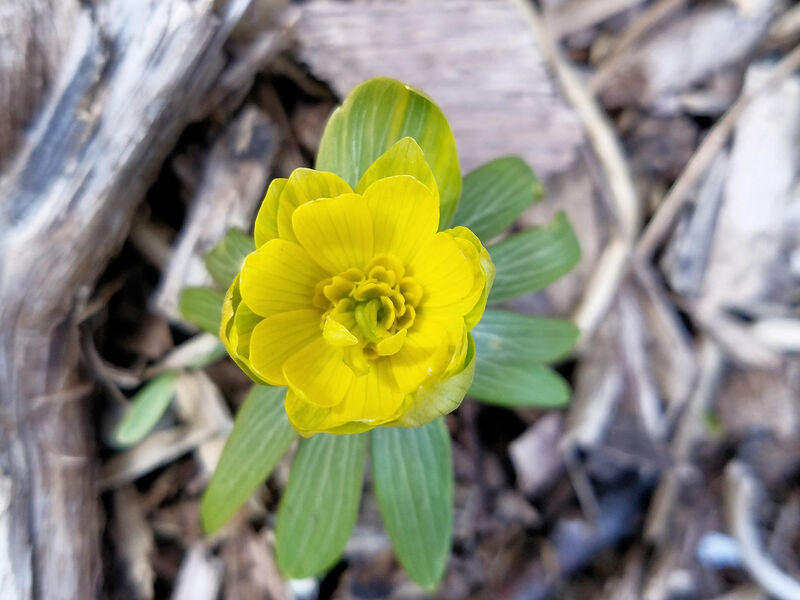 As a cold climate gardener, this concept is so important to me that I decided to write a series of posts featuring the earliest blooming flowers. We have such a long winter; by the time it ends we are just hanging on by a thread. The sooner we have some flowers blooming, the sooner our spring fever eases. Yet so many gardeners are unaware of how many flowers bloom during mud season, that nebulous period which fluctuates between winter one day and spring the next. 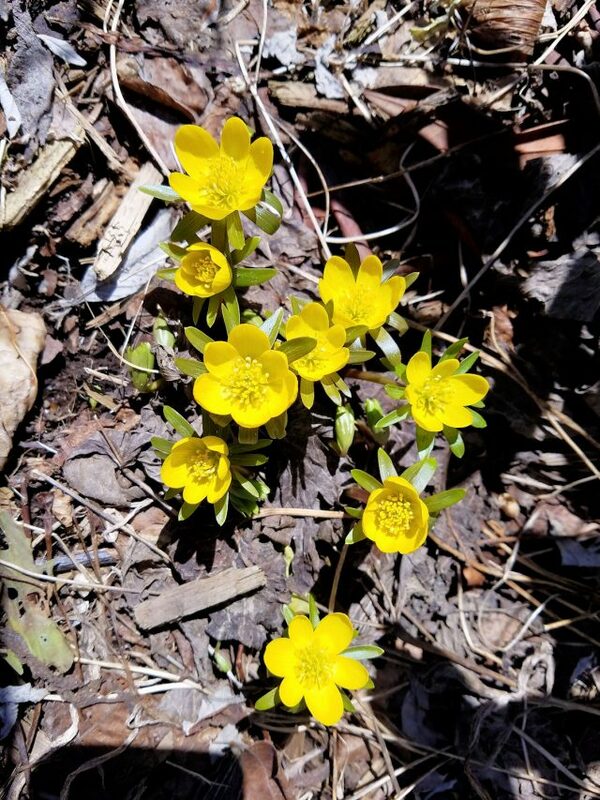 In this series I’m going to discuss them one genus at a time, starting with winter aconites. Perhaps, like me, you’ve been frustrated by winter aconites (Eranthis spp.). After successfully growing them in high school, I never could get them established in my garden until a kind friend sent me some “in the green”. Later, when my sister moved to the Finger Lakes, they were growing like weeds at her new home–seeding into the lawn from the flower beds–and I begged some off of her. I’m at the point now where I really should get brave and divide them. I do see some seedlings as well, but they often get killed by naughty chickens scratching in my garden beds–or by the gardener who insists on planting one more thing. It didn’t bloom for me until I moved it into a sunnier spot. Not that it gets full sun now, just more sun than it used to. Those seem to be the two key things about growing winter aconites: 1) get some from a patch that’s already doing well and 2) make sure they get enough sun to make a flower for next year. If you don’t know a gardener already growing them, try ordering some from Old House Gardens, which takes special care to make sure the corms don’t dry out. And after you manage to get a patch going, check out these other species and varieties. Great post on this early spring blooming plant! With spring being delayed the last couple of years, we need more early blooms in the garden. I will have to add these to my list along with more hellebores. “Plant where the snow melts first.” Such good advice and common sense. Why didn’t I ever think of it? Don’t miss THAT kind of cold here in California but even here we’re getting sick of the unseasonably cold weather.. I have some of the common species in the garden, and have tried growing more unusual ones from seed but have never managed to do so. I think seed has to be very fresh in order to germinate. After moving up to New England, I started looking for the earliest blooming plants I could find! Very good advice about putting them where the snow melts first. I have patches of snowdrops and winter aconite right next to the house, so they started blooming in February before this cold and snowy spring started. I love your ‘Flore Pleno’! 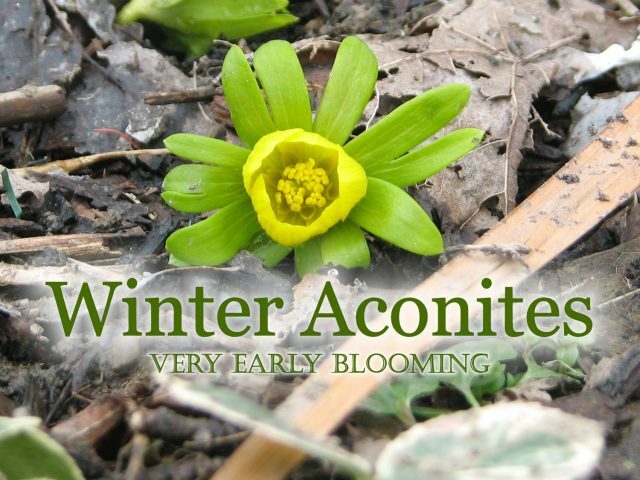 I’ve ordered one and hope it does as well as my other winter aconite that’s seeding around, since I know they can be tricky. I am trying to concentrate on the little miracles of spring. Such as after the heavy frost laid out the tulips on the ground and the sun came out and slowly but surely the tulips stood up…one by one. It truly seemed miraculous. As to your aconites, I have tried them before. They would bloom for a couple of years then die out. I think our summers are too hot and dry for them. They are such cheerful flowers sporting those big yellow grins. I should treat them like annuals and plant them yearly. That is such an amazing tip that I’m annoyed I had to be told it! I’m in Wisconsin looking at 10″ of the white stuff, waiting for it to melt, so I still have time to take a photo of where melts first before I put in that fall bulb order. Thanks! Glad I could help! And sorry about the snow . . .
Alas, our septic field (of course where the snow melts first) is in the shade, otherwise I love your idea of planting early bloomers there. Will have to add aconites somewhere else though! Kate, if you can’t plant where the snow melts first, plant where the snow melts second! If your snow has already melted, try to remember next year to check for those warm microclimates. I’ve had no luck with aconites but your post gives me a reason to try again. Although finding plants that are doing well will be hard. Do you belong to any local garden clubs? I would send the word out there that you are looking to start a patch. Good suggestion, I’ll check around. Although I doubt anyone grows them.